When it comes to taking care of a household renovation or construction project, some people revel in the fact that they possess the tools and the skill to complete the projects themselves. These do-it-yourselfers might not need the services of a contractor or handyman to get the job done, but that doesn’t mean that every aspect of the project can be handled alone. Many construction or renovation projects end up producing a tremendous amount of debris, enough to overwhelm even the most seasoned handymen. Trying to handle all of that leftover debris could result in several costly trips to the city dump, as well as tack on several extra days to the project’s time line. Regardless of the kind or scope of your project, let Fast Haul come and help you ditch your debris in an efficient manner. We have several heavy-duty dump trucks at the helm, capable of handling hauling jobs of any size. 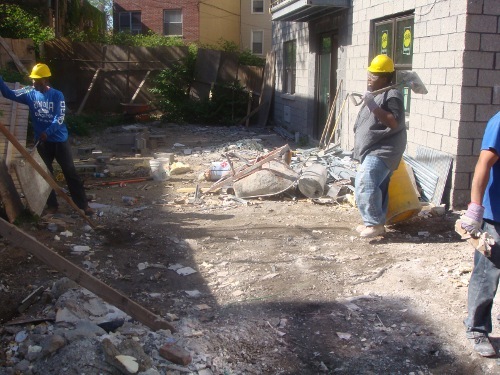 Our crew will be on hand to collect and load the debris quickly and effectively, utilizing wheelbarrows and heavy-duty trash bins when appropriate. We can also bring our Front loader to handle some of the bigger, heavier piles. Whether its inside or outside, construction or demolition, we strive to tackle any hauling job and leave your worksite debris free! Most of the time construction debris must be brought to the dump, but we look for every opportunity to recycle as much of the debris we pick up as possible. Should your debris be recyclable, we are happy to provide you with receipts and documentation show where and when it was dropped off. It’s our way of making the least impact on our environment as possible. In need of construction debris removal services in the Bay Area? Call or schedule an appointment online today for a free estimate. The easiest way to hire the number 1 construction debris removal company in the San Francisco Bay Area is to schedule an appointment online. In fact, not only it is easy, but a Fast Haul representative will come out to your job site to do a free estimate.